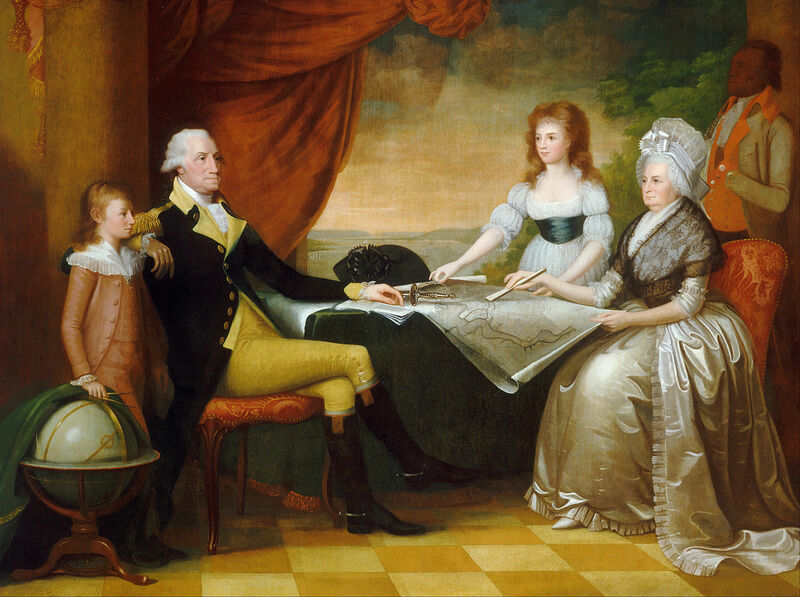 Edward Savage's painting of the nation's First Family quickly achieved icon status when he exhibited it in 1796. 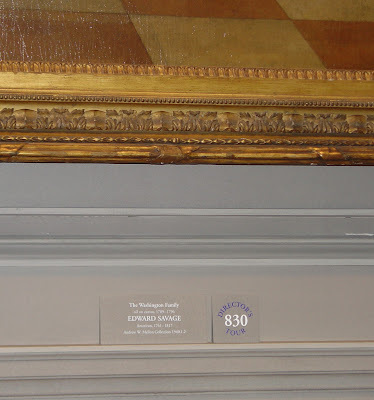 George Washington - who had posed for Savage in 1789, 1790 and 1795 - admired the portrait so much that he ordered four of the resulting stipple engravings in "handsome, but not costly, gilt frames, with glasses" from the artist in 1798. Appropriately, one of these framed prints adorned the small or family dining room at Mount Vernon. 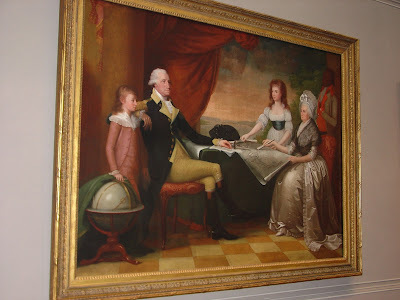 George and Martha Washington had no children together, but raised Mrs. Washington's son and daughter, as well as her son's two youngest children, Eleanor ("Nelly") and George Washington ("Washy") Parke Custis. Savage's portrait depicts the family looking at plan for the new Federal City, to be named after their patriarch. 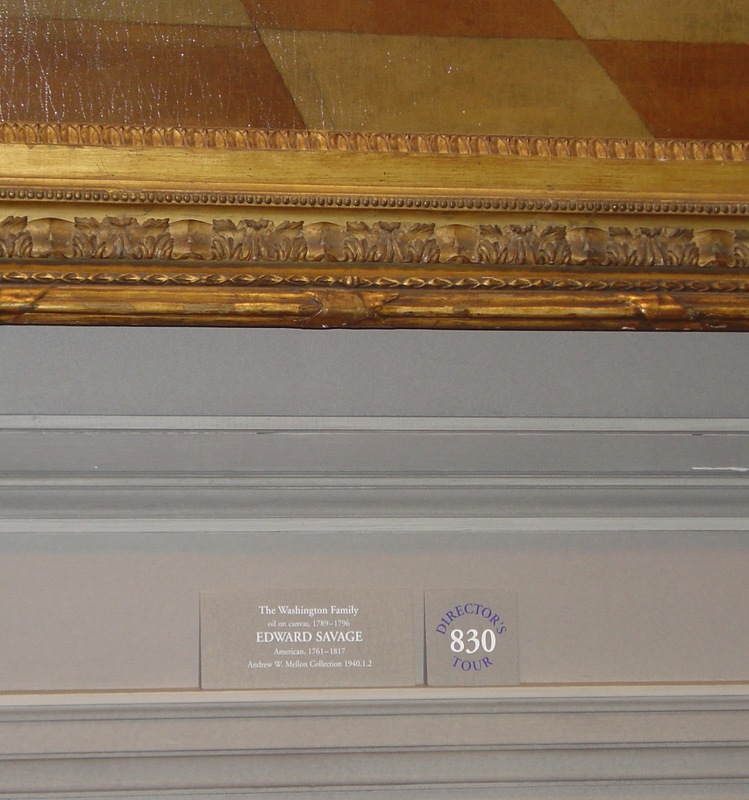 Horizontal, rectangular group portrait of the Washington family in an interior with an enslaved manservant in livery (possibly Billy Lee) standing at the viewer's back right. From viewer’s left to right: George Washington (Washy) Parke Custis stands with his right hand resting on a partially covered globe mounted on a tripod stand. 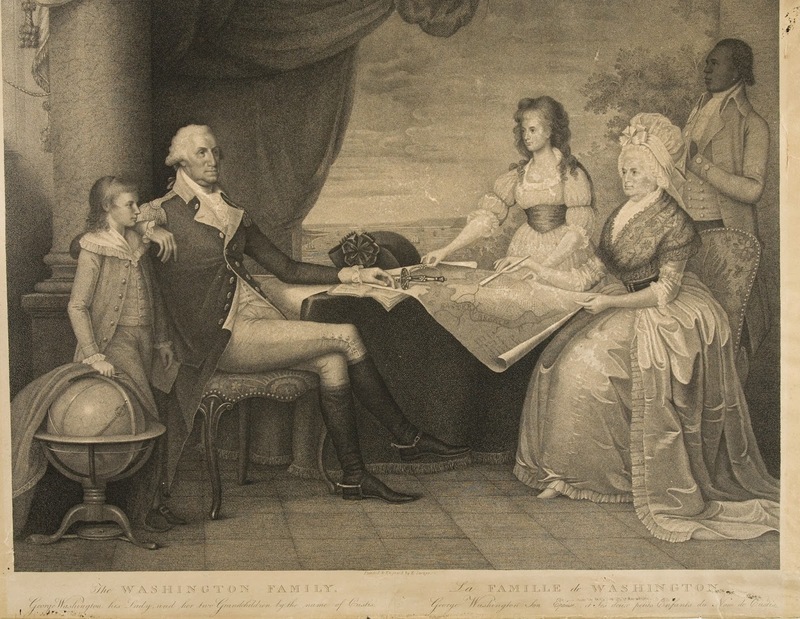 George Washington, in military uniform, sits on a back stool with serpentine-front seat upholstered over the rails and cabriole legs, and rests his right arm on Washy's left shoulder as he looks to the viewer's right and places his left arm on maps and papers on a covered table at center; his sword and black cockaded hat rest nearby. Eleanor (Nelly) Parke Custis, with her hair in long curls and wearing a white empire-waisted gown with elbow-length, puffed sleeves and wide sash, stands behind the table at right, looking at the General and gesturing towards a large, rolled map of the Federal City that she and Mrs. Washington hold open. Martha Washington, seated in a matching back stool to Nelly's right and wearing an open-front silk satin gown with white fichu, black lace shawl and tall beribboned cap, taps the map with a closed fan she holds in her right hand and grasps its curled edge with her left. The interior consists of a tiled floor with a large column at back left. A curtain with tasseled ropes has been drawn back to the left to reveal a distant view of the Potomac River with several boats. Horizon just above center with a few clouds across the sky.